I recently met a guy named Mike Z (no, not Mike D, pay attention) over on Twitter. "Z" is the handle he uses to post on his blog, so I guess I'll go with that for short. Z decided to take me up on my plea for guest posters a few days ago. Yeah, I know. Why would a real reporter for NewJerseyCraftBeer.com want to stoop this low? Anyway, Z picked a local beer to showcase, one from a brewery that I've never tasted a single drop. Thanks for the review, Z. Today I'm drinking an unfiltered River Horse Lager by River Horse Brewing in Lambertville, NJ. Typically, I do not write reviews for craft beer that consist of more than a single line (there are just so many other people that do a much better job than I can ever do). However, when Rob at Daily Beer Review asked for volunteers to write a post for his blog, I jumped at the opportunity. Being new to the craft beer blog scene, this is my first "article" for another blog - and I'm very excited to write it. Since Rob is from the Sunshine State of Florida, I immediately knew that I wanted to pick a local beer to review - afterall, I'm sure the NJ selection in FL is rather slim! 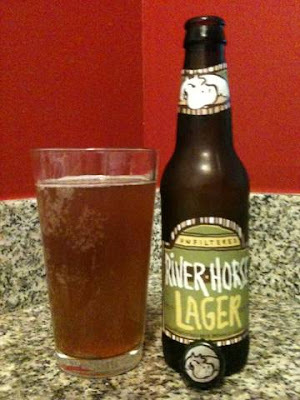 River Horse Brewing is located in central New Jersey about 20 miles away from the capital, Trenton. I was first introduced to River Horse by my girlfriend who brought over a six-pack of their American Pale Ale, Hop Hazard last summer. Fast forward about a year and I find myself in a local bar in Jersey City speaking to Rob, a River Horse Sales Representative. We chatted about numerous things including local breweries, RH's recent brews (check out the Hipp O Lantern Imperial Pumpkin Ale - it's to die for! ), and the name River Horse. Unbeknowst to me, the term river horse refers to a hippopotamus (and apperently a lot of people besides me already knew this). Rob explained that one of the founders of the brewery enjoyed many safari trips to Africa and practically fell in love with the animal. Perhaps he was pulling my chain, but considering the various quirky nuances of the craft beer community, I tend to believe him. "Hey folks this is CRAFT beer, so don't think this is just any old Lager. This beer is actually an 'Ungespundet Hefetrub'. Don't even try to out-geek us." The beer poured a hazy golden rust-like color with a small head which quickly dissipated. There doesn't seem to be a substantial amount of carbonation as the craft is sitting rather still in the glass. On the nose, there is the typical lager malt scent but it's pleasant and not overpowering. Very subtle hints of hops try to balance out the total scent of the beer, but take a back seat to the toasted and biscuity maltiness. The taste is very crisp with bready malts stealing the show. There is a small taste of bitter hops which certainly helps balance the overall taste making the experience refreshing. At the end, there is a spicy finish with a slight alcohol burn. No other flavors make a substantial appearance but there are very subtle hints of sweet (perhaps honey?) and grass. On the tongue, the beer is very enjoyable and smooth making it easy to consume a few bottles in a row. The overall feel is smooth and almost velvety / creamy. Interestingly enough, the carbonation is rather strong which was not expected when looking at the beer while it was resting in the glass (perhaps it was a bad pour). Overall, this is a tasty lager which can be easily enjoyed on a warm summer day at the beach or at your local BBQ! I live in Pa, very close to River Horse Brewing. They have quite a few great little brews. This is one of my favorites. I'm from PA. Next time I'm up north out of FL I'll have to check out this brewery. Congrats on your post! It's like being anointed! Oh, Mike. Quite the kidder. :) Did you see this guy's girlfriend buys him beer? I missed that trait, LOL. She's a gem that girlfriend of mine -- thanks again for posting Rob.